My first ever true love was television. I grew up spending every moment of my spare time watching my favourite TV shows and movies. TV is just as important to me now, just perhaps not my true love any more (that position is now otherwise taken)! I hadn't been collecting Albert Decaris engraved stamps for long before I came across a couple of TV related stamps he engraved; one for France and one for Monaco (I believe that is all). In this blog I shall study the stamp issued in Monaco. 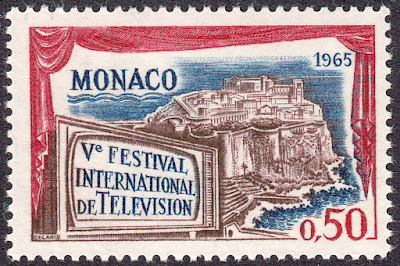 The 1964 Monte-Carlo International Television Festival stamp was issued in Monaco on 3 December 1964 to celebrate the fifth festival to be held in 1965. This lovely stamp is bordered by a curtain, which gives the overall composition a cinematic feel. The eye is then drawn to the bottom left of the stamp where Decaris has quite ingeniously placed a television with the stamp's title on the screen. Behind the TV is one of Monaco's primary tourist attractions: The Rock of Monaco. 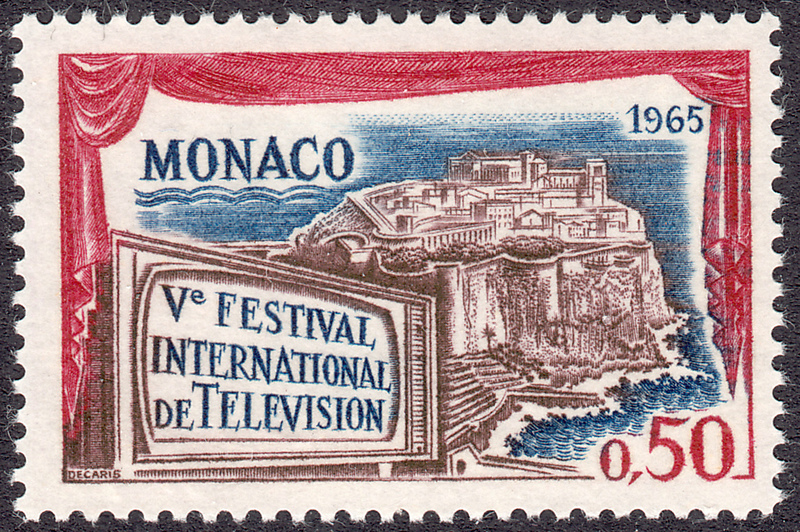 The Monte-Carlo Television Festival was founded in 1961 and based in Monaco. It was created by Prince Rainier III of Monaco as a festival and a competition for television productions. Rainier III saw this new technology as a way to bring cultures closer together and enhance their knowledge of each other. At the end of the festival the prestigious Golden Nymph awards are held (a bit like the Oscars). Winners of the various categories receive a Golden Nymph statuette, which are copies of the Salmacis Nymph created by the sculptor François Joseph Bosio, the original of which is on display at the Louvre Museum in Paris.